Tackling Shakespeare is a rite of passage for any high school student, not to mention any actor who ever hopes to be on stage, but how about tackling all of Shakespeare’s nearly-40 plays all in one go? It’s no sweat for Theatre Aurora, which celebrates its 60th anniversary this year. 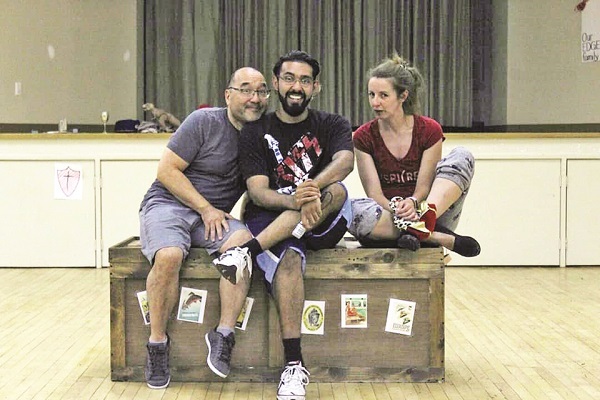 “The Complete Works of William Shakespeare (Abridged) (Revised)” kicks off Theatre Aurora’s 60th season, a season that aims to boil down the entire theatre experience into just six shows. The curtain rises on Shakespeare on September 20, and is followed through the rest of the season by two one-act plays by Daniel MacIvor, the hit Canadian musical The Drowsy Chaperone, Proscenophobia, Kiss of the Spider Woman, and Stepping Out. Over his time at Theatre Aurora, Mr. Ferguson has ticked more than his fair share of boxes on everything that theatre can offer. He started out as a member of Theatre Aurora’s youth company, has acted in and directed a number of their mainstream productions, has been a lighting and technical director, and has returned to the youth program, this time taking the helm. In tackling all of Shakespeare’s plays at once, Mr. Ferguson says his aim is to take theatre “back to its basics.” Bringing everything to life are just three actors on a pretty open stage. There are few sets, few props, and very little in the way of special costuming. “I had heard of the play, having read it last year before Theatre Aurora was looking for directors,” he says. “I then read it again about three or four months later and realised I really liked it and there is a lot you can do with a show like this. It is not your typical theatre show. Whereas typically an audience member will come to see a play, this time they will be coming in for an experience. I have tried to ignore some of the theatre norms that audiences might be used to and breaking them in ways that work with the script and work with this idea of really understanding theatre. What I really like about this show is how it is breaking boundaries that in our modern society people are just kind of too used to. Indeed, Mr. Ferguson says while evening performances officially begin at 8 p.m., the experience begins as soon as you walk through their Henderson Drive doors. As to what that entails, Mr. Ferguson is reluctant to spoil the surprise. There is also an element of the unexpected. While the actors largely stick to Shakespeare’s texts, improv is a big part of the show to keep things fresh. “In the play, one of the actors complains that he will not do dry, boring Shakespeare and they kind of stick with that. He says how when he was studying Shakespeare in school, it was all boring and he would look out the window and watch other kids playing sports. The goal is to make Shakespeare interesting,” says Mr. Ferguson. “The Complete Works of William Shakespeare (Abridged) (Revised)” opens at Theatre Aurora on September 20, running on select dates through September 29. For tickets and further information, visit www.theatreaurora.com or call 905-727-3669.